When left to gather dirt and debris, your eavestroughs can turn into expensive problems that affect your entire home. Being high up on your home, it’s difficult to see exactly what’s happening up there. That is why your Mississauga home needs regular eavestrough cleaning by a professional. It’s the best way to keep your home’s drainage system working. NICK’S Window Cleaning has over a decade of professional cleaning experience in Mississauga. We are equipped and trained to clean everything related to your gutters, including eavestroughs, downspouts, gutters and fascias. Your gutters affect your Mississauga home from top to bottom. Water that doesn’t drain properly can cause damage to your roof, your driveway, and even the foundation on which your home is built. All of these potential problems are expensive fixes that are completely avoidable. Here at NICK’S Window Cleaning, we make gutter cleaning easy. We’ll even set up a regular schedule for your gutter cleaning services so you don’t have to remember to book an appointment. Sealant service which keep your gutters from leaking. Our high quality sealant can last for years, fixing problems before they get worse. Installing downspout guards that direct the flow of water to the right places. This one-time service prevents unnecessary blockages that cause water to overflow in the wrong spots. Eavestrough flushes are a form of gutter inspection, letting us discover where leaks are occurring. This helps your gutters work at their absolute best capacity and a great idea to do before the spring rains comes. NICK’S Window Cleaning is dedicated to quality and professional service. 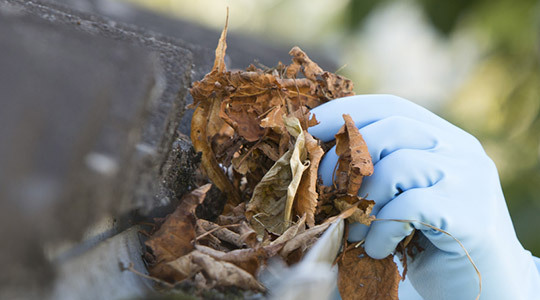 Our staff are well-trained and well-equipped to handle any gutter cleaning situation. For your regular residential job, they’ll clean every aspect of your gutters and eavestroughs, from downspouts to soffits, and they’ll do it by hand for the best results. For tougher cleaning jobs, like post-construction cleaning, our staff uses a specialty liquid cleaner. This cleaner quickly dissolves almost any stain, leaving the gutters looking brand new and perfectly cleaned for the next season. You should have your eavestroughs professionally cleaned every fall and spring to help prevent expensive damage to your home. Water that flows out of gutters instead through them leads to water damage all around your home, but the water that sits inside clogged gutters to dangerous as well. This standing water can seep into your roof and wood on the exterior of your home, causing damage that might not be seen for years. Come winter, the standing water in your gutters will freeze and expand, warping the gutters and, in some cases, popping your eavestroughs right off the side of your house. This is not only expensive to fix, but could potentially hurt someone. Working up to a maximum height of 3 storeys, NICK’S Window Cleaning provides full eavestrough & gutter cleaning services in Mississauga. Our professional workers are fully insured, and highly-trained, using the latest in cleaning equipment. Your property will look it’s best and have fully functioning eavestroughing and gutters for maximum water drainage. Customer satisfaction is a top-priority in our company, so you can look forward to a high-level of service when you select us for your Mississauga gutter & eavestrough cleaning needs. Call us for a free no-obligation quote and experience why more Mississauga residents choose NICK’S Window Cleaning today. Trying to clean eavestroughs by yourself can be a long and dirty job. Why waste your precious free time on such a time consuming and dangerous job? Professionals can clean your eavestroughs much more quickly than you can because they do this for a living. They know how to clean out eavestroughs fast and they have the right tools and equipment to get the job done right the first time. Spend your free time on activities that you enjoy and leave the cleaning to the professionals. One of the biggest causes of foundation damage is water. Water from backed up downspouts and eavestroughs can cause major foundation over time. If you are not getting your eavestroughs cleaned regularly you may already have small leaks and cracks in your foundation from backed up water. Water damage can result in serious structural problems with your home. When you hire a professional to clean out those eavestroughs and downspouts they will inspect your foundation for any signs of damage. The sooner you know about any potential damage and get it fixed the lower the risk is of dealing with a major foundation repair down the line. Stay on the ground and stay safe by hiring a professional to clean those eavestroughs. Professionals have heavy duty commercial grade ladders and equipment that will prevent falls. They are comfortable being up on ladders and working on ladders. Falls from ladders are one of the most often reported causes of accidents at home. Don’t risk an injury or fall trying to clean out eavestroughs yourself. A professional can safely and quickly get your eavestroughs and waterspouts clean while you stay put on the ground.